Home canning using the water bath method for high acid foods. Home canning is a great way to preserve brightly colored peaches, red tomatoes, and dark, rich berries. This way these seasonal fruits can be included in our diets throughout the year. Fruits, because they are high in acid content, are processed using a water bath method, at the temperature of boiling water. This temperature is sufficient to kill all bacteria during processing. At higher temperatures the flavor and vitamin content of the fruit will be altered. Choose fresh firm fruits, and young tender vegetables. Can them before they lose their freshness. For the best quality, use only perfect fruits and vegetables. Sort by size and ripeness, they cook more evenly that way. 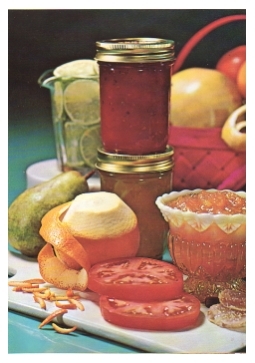 Be sure to read your recipes before beginning, to ensure the proper procedure for canning. These canners are made of aluminum or porcelain covered steel. They have removable racks and fitted lids. The canner must be deep enough so that at least 1 inch of briskly boiling water covers the tops of the jars during processing. Some boiling water canners do not have flat bottoms. A flat bottom must be used on an electric range. Either a flat or a ridged bottom can be used on a gas range. To ensure uniform processing on an electric range, the canner should not be more than 4 inches wider than the burner. You can use any type of large pot as long as it will hold enough water to cover the jars by at least one inch. It must also have a tight fitting lid. Use some kind of rack in the bottom of the pan, to keep the jars from touching the bottom. Watch Your Altitude One thing that is important to remember and to take into consideration when home canning is your altitude. If you live above 1000 feet you must adjust your processing times accordingly. Failure to lengthen the processing times may result in short term shelf life, or spoiled food due to the growth of mold and bacteria and other microorganisms not detected by sight or smell. Food poisoning may result if the spoiled food is eaten. See the chart below for guidelines. Sugar syrups are most commonly used in home canning fruits. They are especially effective in preserving the shape, color, and flavor of the produce. The density of the syrup you use will vary according to the fruit to be canned. Specific directions in each recipe will give you the appropriate syrup to use. The following table details the accepted sugar, corn syrup, or honey to water ratios for the different syrups used in home canning of fruits. 1. Before you start preparing your food, fill the canner half full with clean warm water for a canner load of pint jars. For other sizes and numbers of jars, you will need to adjust the amount of water so it will be 1 to 2 inches over the top of the filled jars. 2. Center the canner over the burner and preheat the water to 140°F. for raw-packed foods and to 180°F. for hot-packed foods. You can begin preparing food for your jars while this water is preheating. 3. Load filled jars, fitted with lids, into the canner one at a time, using a jar lifter. When moving jars with a jar lifter, make sure the jar lifter is securely positioned below the neck of the jar (below the screw band of the lid). Keep the jar upright at all times. Tilting the jar could cause food to spill into the sealing area of the lid. 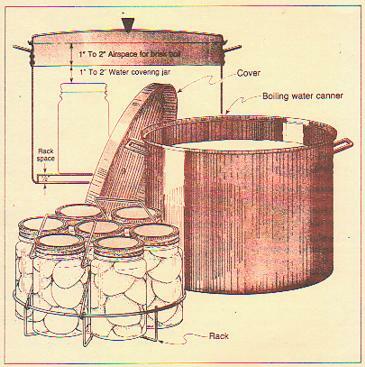 If you have a shaped wire rack that has handles to hold it on the canner sides, above the water in the canner, you can load jars onto the rack in the raised position and then use the handles to lower the rack with jars into the water. 4. Add more boiling water, if needed, so the water level is at least one inch above the jar tops. 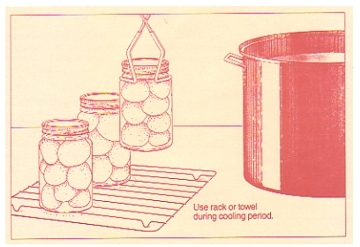 For process times over 30 minutes, the water level should be 2 inches above the jars. 5. Turn the heat setting to its highest position, cover the canner with its lid and heat until the water boils vigorously. 6. Set a timer (after the water is at a full rolling boil ) for the total minutes required for processing the food. 7. Keep the canner covered for the process time. The heat setting may be lowered as long as a gentle but complete boil is maintained for the entire process time. 8. Add more boiling water during the process, if needed, to keep the water level above the jar tops. 9. If the water stops boiling at any time during the process, turn the heat on its highest setting, bring the water back to a vigorous boil, and begin the timing of the process over, from the beginning (using the total original process time). 10. When the jars have been processed in boiling water for the recommended time, turn off the heat and remove the canner lid. Wait 5 minutes before removing jars. 11. Using a jar lifter, remove the jars one at a time, being careful not to tilt the jars. Carefully place them directly onto a towel or cake cooling rack, leaving at least one inch of space between the jars during cooling. Avoid placing the jars on a cold surface or in a cold draft. 12. Let the jars sit undisturbed while they cool, from 12 to 24 hours. Do not tighten ring bands on the lids or push down on the center of the flat metal lid until the jar is completely cooled. 13. Remove ring bands from sealed jars. Put any unsealed jars in the refrigerator and use first. 14. Wash jars and lids to remove all residues. 15. Label jars and store in a cool, dry place out of direct light. Combine the lime peel with several cups of water and bring to a boil. Boil over Med-High heat for 5 minutes, until peel is softened. Drain and discard liquid. Return peel to pot. Add strawberries, raspberries, and lime juice to the pot with the peel and mix well. Gradually stir in the pectin. Bring mixture to full roiling boil that can not be stirred down, over high heat, stirring constantly. Add entire measure of sugar, stirring to dissolve. Return mixture to full boil. Boil hard for a full minute while stirring constantly. Remove from heat. Ladle hot jam into hot jars, leaving 1/4 inch headspace.Process in a boiling water canner for 10 minutes. Remove jars and cool. Check lids for a good seal in 24 hours. In a large ceramic bowl or crock, combine green tomatoes and onions. Sprinkle with salt. Refrigerate overnight. Pour cold water over tomatoes and onions, and let stand for 1 hour. Place black pepper, cloves, allspice, mustard seeds and ground mustard in a small cheesecloth bag. In a large pot, stir together vinegar and sugar, and then add the tomatoes and onions, the cheesecloth bag with spices, the sliced lemon, and minced red pepper. Bring to a low boil, and then simmer over low heat for 30 minutes. Fill sterilized jars with tomato mixture, leaving 1/2 inch headspace. Garnish with thin strips of red pepper arrange vertically along the sides of the jars. Screw on lids, and process in a boiling water bath for 15 minutes. In a large kettle, combine all the ingredients. Cover and cook over medium-low heat for 30 to 40 minutes or until apples are tender, stirring occasionally. Remove from the heat; mash apples (a potato masher works well) until sauce is desired consistency. Pack into hot pint jars. Seal and process for 30 minutes.